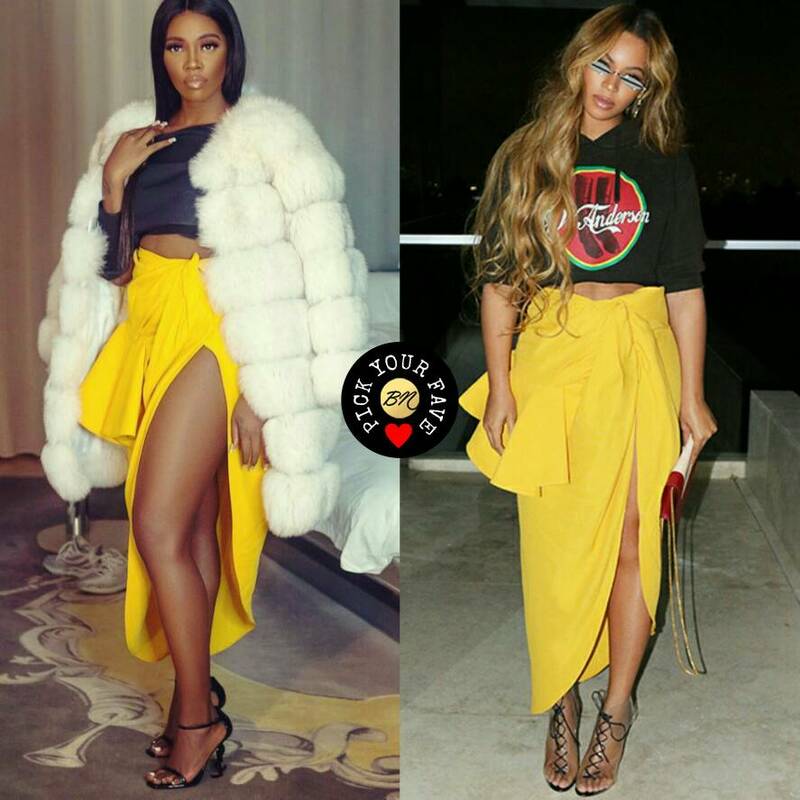 Today’s BN Pick Your Fave features Beyoncé Knowles Carter and Tiwa Savage in this same canary yellow asymmetric ruffled skirt from Jacquemus. Beyoncé rocked the skirt for a recent All-Star Game paired with a J.W. Anderson logo hoodie, Gentle Monster sunglasses, and Gianvito Rossi Plexi lace-up heels. Who styled this skirt better? Davido & Emanuella of Mark Angel Comedy nominated for Nickelodeon Kid’s Choice Awards 2018! ? BN Beauty: Get Ready with Dimma Umeh and Seyi Shay! Mehn, they both look gorge tho! ?? I call it “copy cat” why do Nigerians have to copy everything? How? Because an American wears a skirt a Nigerian cannot do the same. I guess Beyonce has exclusive rights to the skirt. I like how tiwa styled the look, however I think Beyoncé photographed better in the skirt. Tiwa looks beautiful tho! 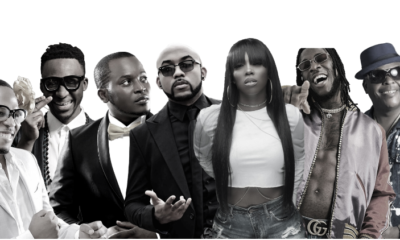 Tiwa hands down, the girl brought it ! Her whole existence in life is emulating Beyonce. What happened to women supporting one another, sentiments aside, you all know that Tiwa rocked that skirt with her melanin magic, but you all are up there criticizing for fear of the bee hive. well yeah obviously its got to be optic illusion air brushed to beyond realistic perfection Tiwa. Not even qween Bee can compete against bionic filtered babes. But in the real world its got to be Qween Bee all day long. Beyonce looks like she woke up, said ‘hmm, this is a cute skirt. 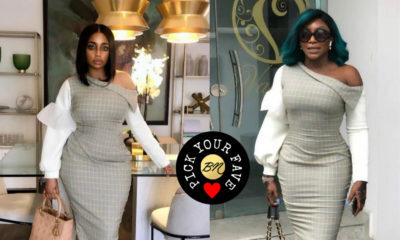 I think I’ll wear this.’ Whereas Tiwa looks like she rummaged through her entire wardrobe, changed clothes about 5 times and spent 3 hours filtering the photo. 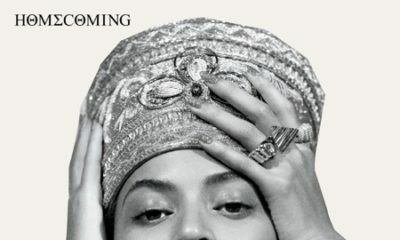 I love that Beyonce, one of the most powerful women in the world, is not even wearing that much makeup and looks effortless. Tiwa tries waaaay too hard and her makeup is tacky and not well-blended, as usual. The sad thing is that Tiwa is stunning and doesn’t need all that makeup. Verdict; Beyonce for the win. You don’t have to write so bitter about tiwa? @Ogonna And you don’t need to defend yourself under ridiculous aliases, Tiwa. Just do what your idol Beyonce does: stay unbothered! Remember: always stay gracious, your best revenge is your paper. Ogonna, drink a glass of water, please. Why so ‘attack-ish? Or are you Tiwa? ? @sameerah I dont know what to say to you. So you believe beyonce woke up like that? You sure put in alot of work to make sure we see tiwa as tacky.